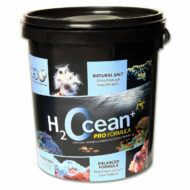 Reef Aquarium Compatibility Not reef safe. Will eat stony corals, but can sometimes be kept with some of the more noxious soft corals. Clams, feather dusters, small ornamental shrimps, sponges, zoanthids etc will also be eaten. The graceful Addis Butterflyfish is a common sight amongst areas of rich coral growth in the Red Sea and Gulf of Aden, swimming in pairs or small aggregations to depths of 20m (66ft). An imposing, large-growing species, the Addis Butterflyfish is best suited to very spacious, mature aquaria with an abundance of live rock for the fish to browse upon and forage amongst, together with a roomy swimming space along the front of the tank. Unfortunately, all stony corals, many soft corals and a whole host of other invertebrates will be picked at and eaten, but some of the more noxious soft corals are usually safe if the butterflyfish is kept well fed. As with all butterflies, this species demands excellent water quality at all times - thoroughly filtered and well oxygenated, with areas of brisk current. Addis Butterflyfish are relatively peaceful and are best maintained in groups of 5 or more, added simultaneously, and preferably with all being of similar size to one another; bearing in mind that juvenile fish tend to acclimatise more readily than larger adults. Tankmates should be of similar size and temperament. Avoid housing with other species of butterflyfish as territorial issues are likely to arise. 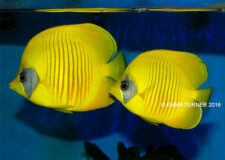 Once settled, Addis Butterflyfish will become very assertive feeders and will compete with most other fish species. May also be seen on sale as the Bluecheek Butterflyfish, Blue Mask Butterflyfish, Golden Butterflyfish, Red-lined Butterflyfish, or Red Sea Butterflyfish. Offer a wide variety of foods, fed in small amounts several times per day. Frozen foods such as Angel & Butterfly mix, Mysis shrimp, vitamin-enriched brineshrimp, finely chopped clam/mussel/cockle/crab/shrimp/squid etc should be given, along with some greenfoods. Ensure the larger foodstuffs are chopped into small enough pieces on account of butterflyfish having tiny mouths. This species has not been bred in the home aquarium.